There was once a daughter who often complained to her father about her life and how things were so hard. I did not know how to do to go ahead and thought he would give up. She was tired of fighting. It seemed that when a problem solved, appeared another. His father, one chef, took her to his place of work. She filled three pots with water and placed each on a high fire. Soon the three pots water was boiling. 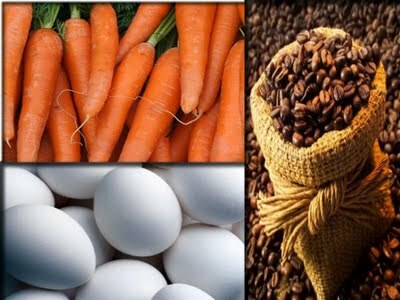 In one he placed carrots, in the second she placed eggs and the last she placed ground coffee beans. Las dejó hervir sin decir palabra. La hija esperó impacientemente, wondering what his father was doing. In about twenty minutes she turned off the fire. He pulled the carrots and put them in a bowl. She pulled the eggs and put them in another bowl. He took the coffee out and placed it in a bowl. Turning to her daughter told: “Dear what do you see? ", “Carrots, eggs and coffee”- was his reply. Then brought her closer and asked her to feel the carrots. She did and noted that they were soft. He then asked her to take an egg and break it… After pulling off the shell was observed that hard. Then he asked her to sip the coffee. She smiled as she tasted its rich aroma. He explained that these objects had faced the same adversity: boiling water, but each reacted differently. The carrot went, strong, hard… but after going through the boiling water and became weak, easy to undo. The coffee beans were unique, however. After being in boiling water, had changed the water.